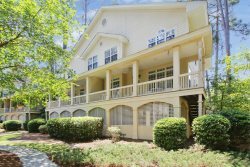 Experience Hilton Head Island as the "locals" do when you stay in this 4 bedroom, 4-bath home in Sea Pines Plantation, located in a neighborhood with close proximity to the beach. This enchanting home is a perfect vacation escape for families or friends, and enjoys an idyllic location within biking (3 minutes) or walking distance (7 minutes) to the beach from the adjacent bike path. Upon entering the home you will be greeted by a large mud room featuring a full size washer and dryer. The first bedroom down the hall leading to the main living area is 1 of 3 master suites with a king sized bed, flat screen TV, private bath with a walk-in shower, and balcony access. This large bedroom also includes a sitting area with a couch and plenty of space to relax! The second master bedroom offers a king sized bed and flat screen TV. This room shares deck access with bedroom 1 and also has a private bath with double sinks and walk-in shower. The third master features a king sized bed and TV, private bath, and access to the atrium. Down the hall from the bedrooms you will find the ultra-inviting, open concept living room and kitchen. Thoroughly updated and equipped with all of the cooking essentials, the kitchen includes tray ceilings, stainless steel appliances, and white cabinetry for a fresh, modern, and clean look. The large windows offer plenty of sunshine while enjoying a family meal at the breakfast table with seating for 4 or eat-in kitchen counter. The living room showcases comfortable seating, vaulted ceilings, a 50" flat screen TV, and access to both the atrium and back deck. Although this home is beautiful, you might find yourself spending most of your time in the backyard grilling out on the gas grill, enjoying the pool, and relaxing while enjoying the tranquil lake view. The fourth bedroom is located upstairs and includes a full sized bed, private bath with stand-up shower, and desk area. Garage is not available for guest use. Pool is can be heated for an additional cost. This villa also comes with 1 hour per day of free tennis at the South Beach Racquet Club. Please request a tennis pass prior to arrival. Clean, close to the beach, well appointed kitchen. Lovely home that was spacious, bright and clean. Great floorplan that allows plenty of privacy for multiple families. The pool was fantastic and the location of the property was ideal. We loved the property. I was in great condition and a great location. We loved how the kitchen and the living area were open so when we were cooking we were able to still be with our whole family.